Lake Wanaka is location at the foot of the Southern Alps of NZ Sth Island with the wilderness of Mt Aspiring National Park nearby. 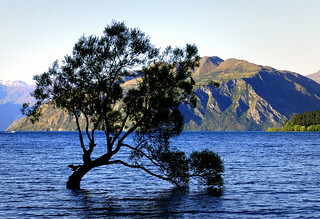 Roys Bay is at the southern end of Lake Wanaka. Rooted firmly into the earth near the shore of Roys Bay is a lone tree. On high tide its base is submerged. How it got there I don't know. Was it a seed dropped by a bird many years ago, maybe. One thing's for sure, it's a very popular tree with photographers, painters and sightseers. A famous land mark to the area.